The day your daughter turns 16 is one of the most important birthdays of all, and likely the biggest you will have to organise as a parent. Since it is the final party of her childhood, you’ll want to throw the greatest celebration she will ever have. Although the party will be fun for her, there is the huge workload in arranging it all by you beforehand to ensure it runs smoothly. After the cake, presents, location and invitations have all been dealt with, hiring a pink limousine for her and her friends to arrive in is probably the most important gift you can give your daughter on her 16th birthday. Not only is a pink limo the dream carriage of many a young girl, but there are some practical reasons that make it worth hiring too. Firstly, taking into consideration how impatient and anxious teenage girls can get, it allows the party to start much earlier, at the pick up stage, easing her and her friends into the celebratory mood. Secondly, it solves the logistical nightmare of organising transportation for everyone, easing a large burden from other parents, and making you the hero of the hour. Thirdly, picking them all up, one by one, will make all the passengers feel like VIPs, meaning your daughter truly will be a much appreciated star of the event. The best part about all this is that calling Bergen to organise a limo is one of the easiest parts of putting together the birthday party. Arranging such a colossal event can be quite a large workload, so in order to start you’ll need to establish the when and where of everything before getting caught up in any of the other details. The ideal time to celebrate would be on the day of her actual birthday, but before getting too attached to it you should consider whether all the main desired attendees can make it on that date. Other factors, such as school, work commitments, and even other family events, should be taken into consideration too. If her birthday day proves too impractical than be sure to hold the party at a time still relatively close to it, or much of the excitement for it may wane. Of course weekends are usually the best time for these sorts of events. Another consideration is getting permission from other parents. Whether the event is set at home or at a luxurious high profile venue, the limo ride has become one of the most desirable aspects of a young girl’s birthday party. Some of the most successful teenage girls’ parties now include pink hummer limos. 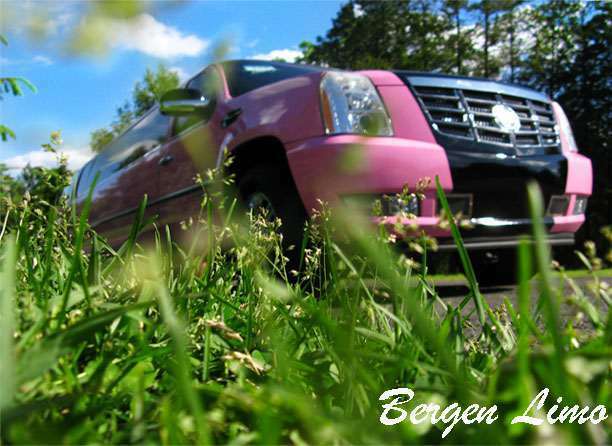 Rest assured that at least the traveling part of the night will be a guaranteed success by booking a pink hummer limo with Bergen. With so much to stress over getting right for the big day, why wouldn’t you make sure that one of the most important, yet simplest, of tasks was taken care of straight away? Help your daughter impress her friends with a pink stretch hummer by calling us on 201-703-7979 today.